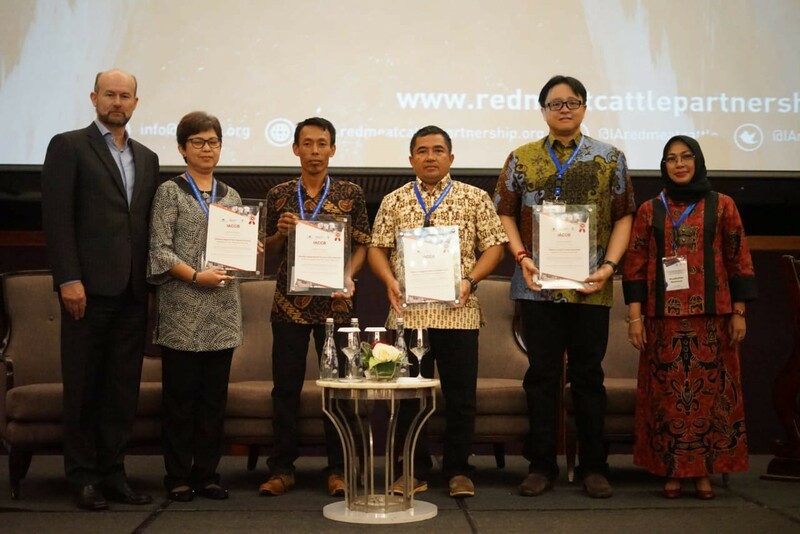 The Indonesia Australia Partnership on Food Security in the Red Meat and Cattle Sector (the Partnership) awarded Certificates of Achievement to four Indonesian cattle breeding companies and co-ops from East Java, Bengkulu, South Kalimantan and Central Kalimantan. This achievement is an important milestone in becoming commercially sustainable. The event was conducted at the “Indonesian and Australian Cattle Breeding Program Symposium” held by the Partnership in collaboration with the Indonesian Society for Animal Science (ISPI) in Jakarta (12/9). The presentation marks the achievement of four cattle breeding enterprises in pursuing herd productivity, cost control and managing the broader environment. They have been assessed as potentially commercially sustainable following more than 18 months in partnership with the Indonesia Australia Commercial Cattle Breeding Program (IACCB). The companies are sharing all data and the lessons learnt so that interested parties may learn, invest and succeed in the sector. The remaining three organizations in the program are well on track to also gain their Certificate of Achievement. Wisnu Wijaya Soedibjo, Deputy for Investment Cooperation of BKPM, the Indonesian co-chair of the Partnership, stated that Indonesia is pursuing more commercially sustainable business in the red meat and cattle sector and inviting more investors in the sector to achieve Indonesia’s target in increasing cattle population and expanding trade and investment to other countries, “Indonesia has a tremendous potential in this sector. However, the domestic and foreign investment in this sector can still be leveraged. I invite business people, from both domestic and foreign to participate and grow investment climate in Indonesia,” stated Mr Soedibjo. Based on BKPM data, domestic investment in the Indonesian red meat and cattle sector is only about 0.32% of the total domestic investment in 2017, while the foreign investment in the livestock sub-sector in 2016 is only 0.48% of the total foreign investment. Australia’s Charge d’Affaires to Indonesia, Allaster Cox, said that Indonesia and Australia have a long and important history of cooperation in agriculture. The symposium is attended by more than 200 red meat and cattle sector practitioners and academics, including industry representatives and farmers such as PT Lembu Jantan Perkasa, PT Sulung Ranch, and eight breeding enterprises that has been partnering with IACCB over the last 18 months. The symposium aims to provide a platform for the practitioners and academics to exchange ideas on the challenges and opportunities of breeding cattle on a commercial scale in Indonesia to contribute positively to Indonesia’s food security as well as the Indonesian investment climate. ISPI as an implementing partner of the symposium is very excited to gather inputs and learning from the breeding cattle industry. “The learning and experiences from the industry will provide valuable inputs for promoting commercial-scale cattle breeding operations and increasing the cattle population in Indonesia,” said Ir Didiek Purwanto, the Secretary General of PB ISPI.